The judges wrote a wonderful review that I'm thrilled to share. 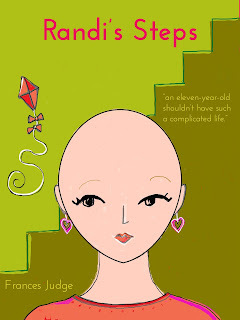 "Randi’s Steps is a beautiful, bittersweet story told by Francie, the little girl neighbor who befriends Randi when she moves in next door. Judge captures a wonderful narrative voice, real and warm and very human. Francie loves having a best friend like Randi, who is different in seemingly tiny ways, like being Jewish, but who loves enough of the same things that Francie loves to make her the best of best friends. I liked the description of Randi’s Tinker Bell laugh with the occasional snort (13). Right away, Randi is described as being subject to headaches, which of course adults will understand. I think Judge conveys a progress of Randi’s illness perfectly. For all that Francie loves Randi, Francie is healthy and in need of healthy friends. She reacts with joy to happy playtime and reluctance to having to endure hardship. When she is called upon to accompany Randi to the hospital, her deepest thoughts reveal she is not having a great time. Judge uses wry humor and perception, on her narrator’s part, to demonstrate the misery suffered by children with cancer. She also uses deft strokes to show that Francie, being healthy, needs to live, and is in many ways as doomed as Randi to experience weakness insofar as Randi’s illness is concerned. Francie tries to be the best of best friends and fails, just as Randi fails to survive. This is a brilliant story told by a talented author. The cover art is simple and fetching, revealing a sub title that doesn’t show up as much as it might. Red letters might have been better, as in the title itself!" Congratulations on the positive review! Keep on persevering and don't lose hope, for in due time your hard work will be rewarded. Perennials grow quickly but they only last a few months. Trees take years to grow, and they can last over 100 years! This story is a great example of the well writen story, which may be as an example for a huge amount of students. I think you could work as a pro writer at the writing services, loke this one https://academicsavers.com/buy-term-paper/. I think that you have to try yourself.